The new shorter .UK domain, released for registration on 10 June 2014, has already more than 100 000 registrations. It could be considered as a staggering number if it was not for the fact that approximately two-thirds of the registered .UK domain names are the shorter equivalents of other sub-domains, such as .CO.UK or ORG.UK, that were registered by their holders who had been granted the precedence to register their existing names under .UK. This so called Grandfathering phase will last 5 years and, in consequence, will block some desirable names from being registered. Nevertheless, the launch of the .UK extension seems to be a big success. 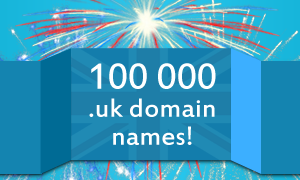 About 30 000 domain names other than 10 million names registered in subdomains of .UK have found new owners within a month – that is an impressive result. The release of the shorter .UK domain has also boosted last month’s registrations in general, resulting in 225 000 new names registered in other subdomains including .CO.UK, ORG.UK and ME.UK. If you wish to register a .UK domain name or any other name of your choice, please click on the domain to find out more about it. Should you need any help, please do not hesitate to contact our Support Team at support@web-solutions.eu.